recognize Charles Darwin and his Theory of Evolution by Natural Selection and commemorate the important contributions he has made towards the advancement of our understanding of the biological world and the improvement of the quality of life for humankind. 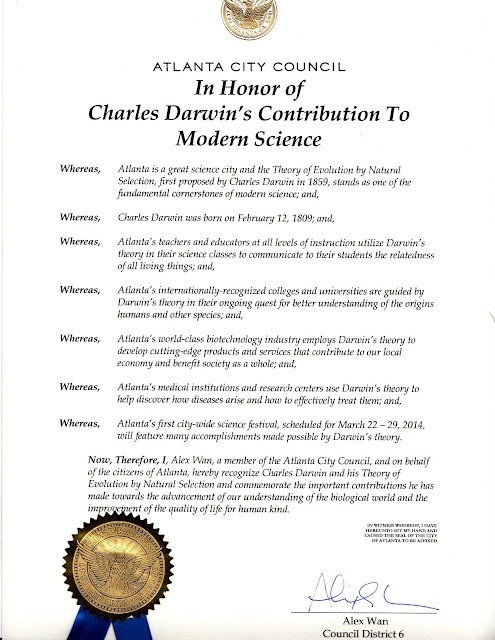 This is the first step in our efforts to have February 12 proclaimed "Darwin Day" in Atlanta by the full City Council in 2014. You can view and download the text of this year's proclamation here. Thanks for your work on this Marc. Darwin was a great man, and deserves recognition like this.